Has the glass on your woodburner suddenly cracked, or been damaged by an accidental knock by your fire logs? Cracking can happen due to a range of reasons, but the two most common causes are impact and use. If you’ve overloaded the firebox with logs for fuel, you may have knocked the stove glass into a log protruding from the box, resulting in the glass cracking. Glass hit from the outside by a heavy object can also result in cracks. Although woodburners are extremely sturdy due to the materials they are manufactured with, over-use can still end up damaging your stove. Overfiring can happen when the stove is too hot, which in turn can crack the glass on the door of the stove. Burning household coal in the enclosed space of a woodburner stove can result in volatile mini-explosions, the force of which can crack the glass on your stove’s door. If you do not replace the glass of your woodburner, you run the risk of it completely shattering the next time you fire it – higher temperatures will almost always worsen a crack in glass. This could have dangerous consequences for your home, so our team at Abbey Glass would recommend you have the glass replaced as soon as you notice a crack. How to replace the glass? Clean the door of your woodburner to make glass removal an easier process. Remove the door – this will make it far easier to access the screws holding the glass in. Release the cracked glass by untightening the screws or bolts. Replace and reseal your new glass panel. Alternatively, you can order a replacement glass window for your stove woodburner, cut to size for your requirements from Abbey Glass. 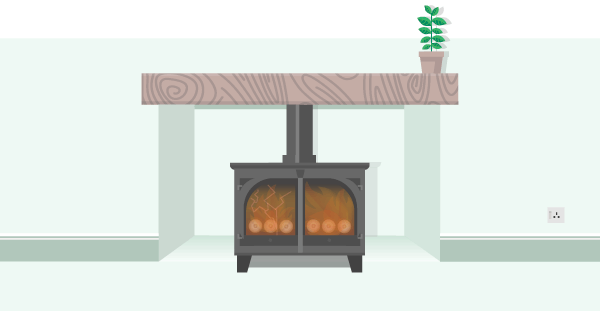 Our team of professionals will cut the glass at our facility in Sheffield, and will then fit the new glass for you, restoring your wood burner to complete working order again. Just give us a call today to discuss measuring the glass for your new stove glass, and our team will be happy to help you.